The sergeant entered service August 15, 1943 in Dover, N.J. He was trained in Salina, Kansas; Nebraska and New Mexico. He received his wings at Tyndall Field, Fl. He worked at Picatinny Arsenal in New Jersey before going into service and before that was in the Army stationed in Hawaii. Sgt. 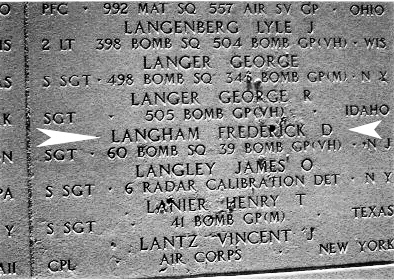 Langham, born August 7, 1913, lived in Cherry Tree, PA until he came to Dover, NJ. He graduated from Cherry Tree High School. He was survived at the time of his death by his wife Florence, pregnant with their daughter, his mother Mrs. Jennie Langahm and two sisters. 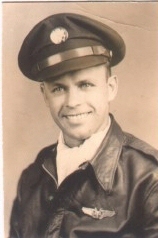 To anyone who knew Sgt Frederick D. Langham during is days with the 39th BG days or earier, Freddi would is interested in making contact to learn more about her father as she was born just months after his loss.